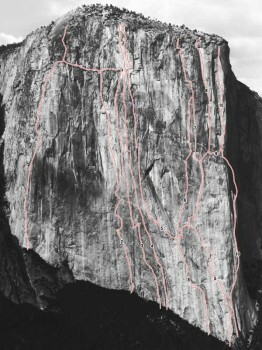 Moderate difficulty and distance from other crowded routes have recently boosted Dihedral Wall's popularity. The climbing is as hard as the Zodiac and easier than Cosmos. Although the first five pitches lean to the left, rumors of long stretches of mandatory left-handed nailing are exaggerated. Characterizing the lower part of the route are large pin scars that take sawed angles (often hand-placed), nuts and aliens. The middle of the route steepens while the last part follows large chimneys and gullies —easy to free climb but hideous to haul. Which SuperTopo guidebooks include a topo for Dihedral Wall? Dihedral Wall is route number 2.